30 September 2018, AMBA queen KEMI ASHU posted a story captioned. ATANGA NJI PAUL, fraud for life. Since then, a host of French papers have taken the cue with diverse publications in that regard. Today, this French paper cites more of such stories but puts it in the interrogative, allowing the latitude of the reader to draw his own conclusions and to prevent suspension from PETER ESSOKA-NCC. We have simply completed the above mentioned facts. 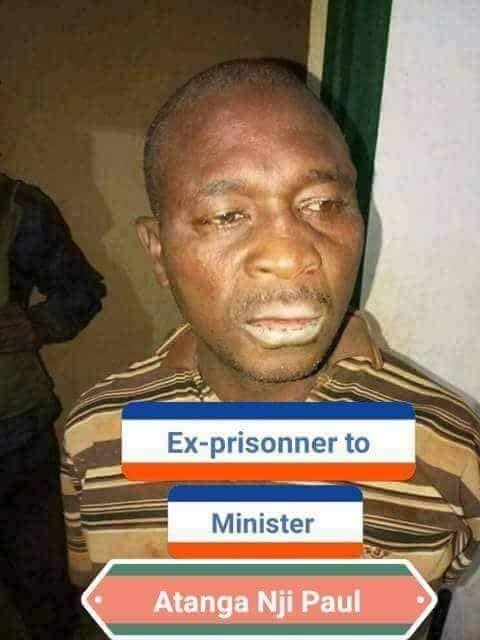 ATANGA NJI (PETER) later found his was in spying quarters where he worked with late spy king JEAN FOCHIVE (the hang man of the regime) at the spy head quarters in LRC, the most dreaded CENER. Many people who were picked up by the above in the Ahidjo and Biya days were never found, they were silently executed and their corpses were secretly disposed of. Whats happening in Ambazonia today is a perfect remake of the FOCHIVE era where people are whisked off from their homes at owlish ours and silently liquidated, some, without a trace. 3AM was Fochives most appropriate time for meetings and for executions. When BIYA finally eliminated most of his potential enemies, he secretly liquidated JEAN FOCHIVE. The latter knew too much and became a threat to the regime, perhaps as his loyalty must have dwindled with time. The hunter became the hunted! ATANGA NJI (PETER) also surfaced in the PANAMA PAPERS among those who had siphoned a colossal 3,500 Billion XAF from State and stashed the money in tax havens in the Caribbean islands, while the masses wallowed in misery back home, all these, with the blessings of their puppet master, BIYA. Lire aussi: L'ex- commissaire Junior Zogo: "Il y a faux et usage de faux grossier et grotesque sur les signatures de Paul Biya: Il y a une scène funeste en marche au Cameroun "
ATANGA NJI (PETER) was also indexed as having masterminded the plot that lead to the abduction and smuggling of SISIKU AYUK JULIUS and other ambazonia leaders from Nigeria to Cameroon. This claim is supported by the fact that he insisted that other Ambazonia activists will be brought back in the same plane that brought AYUK JULIUS and co to LRC. We later got word from veteran journalist ELIE SMITH that ATANGA NJI (PETER) was planning to frame ERIC TATAW with murder so as to have him arrested and brought to LRC. When the Fako chiefs were abducted, fingers pointed to ATANGA NJI (PETER) and his twin brother and partner in crime EKEMA PATRICK ESUNGE for having masterminded the abduction for personal and political gains. A Buea councilor with burn scars was made to pose as a chief and undressed in public so that AMBA could be framed for wickedness and barbarism. Out of the agreed package, the chiefs received peanuts as reported by KEMI ASHU, that is when the alarm blew. Ekema and ATANGA NJI (PETER) shared the rest of the money and the chiefs went home empty. ATANGA NJI (PETER) didnt stop at that, he got footage from a Nigerian movie in which the set depicted some cannibals in action and he brandished this footage to the world that ambazonians were cannibals who caught and ate their victims and they must be wiped out. Gullible as francophones are, they fell headlong to this scam amid uproar and they only realized the dupe when French blogger MAX SENIOR IVOIRE brought the truth to the limelight. ATANGA NJI (PETER) rallied chiefs, political elite and the civil society, paid them millions and asked them to openly declare their support for Biya in fake motions of support and in fake press declarations on CRTV. The so called G20 each received the sum of 7.5 million xaf while JEAN DE DIEU MOMO had double the amount as reported by BORIS BERTOLT. ATANGA NJI (PETER) rallied over 40,000 bike riders from all over, including students, labourers, taxi drivers and others for a grand meeting in Yaoundé. He promised them full reimbursement for their transport fares, accommodation and stipends for participation. This grand rally ended up being a march to support candidate Paul Biya. All media organs covered the event live, after which, Atanga Nji disappeared in thin air. The youths got stranded there with no food nor water, nor transport nor the dues promised them. They raved and ranted on camera but lo, the deed was over and done with, Atanga Nji had achieved his aim. Shortly later, the bomb exploded when ATANGA NJI (PETER) bribed all newspapers to publish the fake opinion poll that was carried out by a certain US firm which gave unpopular Biya 81% score in the next elections. That firm ended up being revealed as belonging to ATANGA NJIs (PETER) brother who is based in the US. The information had already gone across before then. ATANGA NJI (PETER) masterminded the Emergency Humanitarian Aid scam that was going to assists EDPs AND IDPs. When the money was finally collected, ATANGA NJI (PETER) visited an unknown warehouse in Douala and showed the world that Biya was ready to reconstruct those burnt villages among other things. Poisoned juice CRTV relayed the visit live. Political pundits cried foul that it was actually money for political campaign that was being raised and not for the said purpose. Besides, people wondered how this assistance could be possible when the war was still going on. Later on, ATANGA NJI (PETER) turned around and said that those in the bushes were all terrorists and didnt deserve any assistance. Such is how the Emergency Humanitarian Aid died naturally and no one is talking about it till date. During the last LRC elections, ATANGA NJI (PETER) said all went well in perfect peace all regions, (including Ambazonia), when we know that the violence reached its peak in all localities on that day, to the point where a high ranking officer, Buea DO was shot and his present state and whereabouts are yet to be determined. Who knows if he is still alive even? Atanga Nji ensured that no media organ talked about it. In the past, CRTV would have put it on headline news so as to castigate Ambazonia. This time, the world is silent. In spite of all the fraud, the total voters in Ambazonia may not have reached 1,000 in both zones. The devil alone knows where the 46,000 and 23,000 voters from both zones came from when almost the entire ambazonia is internally displaced. All that, thanks to the works of ATANGA NJI (PETER). At the height of all fraud, ATANGA NJI (PETER) hires hungry looking tourists to pose as transparency international elections observers for a loathsome USD 300, 000 in complicity with CRTV, his partner in crime. When the cover was blown, ATANGA NJI (PETER) whisked off these observers out of the country in the dead of night to prevent further evidence. As someone once said, in politics, all means is good as long as it’s efficient and it delivers the desired results, which means, even if the entire ambazonia has to be killed for Biya to stay in power, there is no problem. LRC is about to get the fakest results ever from a Presidential Elections which will be closed to the figures predicted by the fake US firm all thanks to the works of ATANGA NJI (PETER). What we always forget to remember are the lessons history teaches us. In past years, MARAFA HAMIDOU YAYA rigged elections repeatedly over the years with his sinister scheme of at least 500 ghost polling stations that were stuffed with CPDM votes. He imagined he was doing Biya a favour. At the end of the day, it landed him in jail. Perhaps ATANGA NJI (PETER) imagines his fate will be different. He may not have read the Frankenstein story. How did JEAN FOCHIVE die? The same method he used to kill people was used on him. He was invited to meet a VIP of LRC. He got to the venue and sat down waiting. Poisonous gas was fitted in the A/C condenser and he inhaled the poison to his death. His family tried to make noise but they were silenced with death threats from the regime. ATANGA NJI will end up the same, same measure pressed down, well shaken and rolling over.